Scientists have discovered a specimen of Elasmosaurus in Alaska. The fossil was discovered in an expedition to the Talkeetna Mountain region by the University of Alaska Museum. 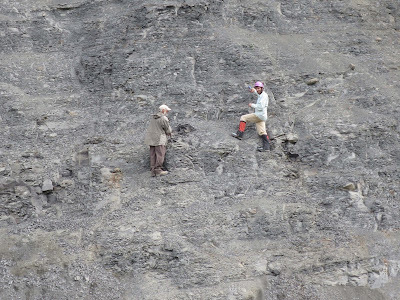 It is the first time a Elasmosaurus fossil has been found in Alaska. The above image is a painting made by James Havens, an artist from Anchorage, depicting life in the ocean at the end of the Mesozoic era that shows Elasmosaurus who were swimming. Elasmosaurus that live in the oceans 70 million years ago during the Mesozoic era. As with other plesiosaur, Elasmosaurus has two pairs of legs like oars that serve to swim. Patrick Druckenmiller, a curator of Earth Sciences said in a statement, "So far, we have only to imagine how the shape of the giant mythological creatures, and now we can really know how to shape. This is an exciting discovery because it is the first Elasmosaurus ever found in Alaska." Some of the vertebrate fossil skeleton was first discovered by Curvin Metzler, a fossil collector who lives in Anchorage. He has hiked in the area for 25 years and saw fossilized bones sticking out of a cliff. The skeleton was located about half way from the vertical cliff as far as 60 feet.